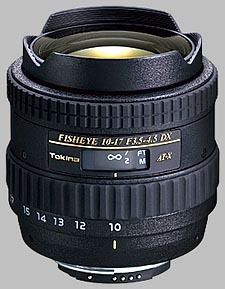 (From Tokina lens literature) The new Tokina AT-X 107 DX is a full-frame fish-eye lens that gives the photographer a 180 degree field of view with dramatic curvature of field or "fish-eye" effect. With this lens an entire view or vista can be captured, wider than the human eye can see. The AT-X 107 opens an entirely new dimension of photography. For what it is (a fun lens) it is an excellent lens. It is sharp at all focal lengths and all apertures and gives an excellently curved field of view. I took this lens to Chichen Itza Mexico to photograph the Myan Ruins. Everyone and their mother who owns a camera takes tons of pictures there so I figured I would try some different perspectives. Thsi lens did not disapoint!! Also if you get into a situation where you do not want the exagerated perspective of a fisheye (Taking a picture of the wife) if you zoom in to 17mm the lens is pretty close to rectilinear especially in the center. This makes a good ultra wide walkaround lens for a place that has been photographed to death. Good lens. Above 15mm it doesn't vignette on full-frame. The only trouble is the field curvature which takes a bit of getting used to. Basically, at 4 feet of focus distance, the corners are focused beyond infinity. At 3 feet focus distance, the corners are almost within the DOF wide open, but not quite. At 2 feet the corners are sharp but the center isn't within the DOF wide open. If you want a sharp image across the frame, you need to stop down to about f8 for DOF, and focus very carefully so everything is within the DOF.